You must make reservations at least 5 minutes in advance of the time at Patina Restaurant. Valet parking is available in front of the restaurant for $8 with validation. Complimentary valet parking after 8pm with validation. Take the Metro red line; exit at Hill Street. Walk one block west. Patina is located in the southwest corner of the renowned Walt Disney Concert Hall. Chef Joachim Splichal’s Patina is an impeccable choice for private events in Downtown Los Angeles. Awarded four stars by the Los Angeles Times, Patina captures the elegance and sophistication of its location. The Chef’s Table (seats 9) is a remarkable location for any intimate dining occasion and allows a personal view of the action. The Private Dining Room (seats 30) with its walnut paneling, modular glass wall, and audio-visual equipment make it an impressive choice for a lunch or dinner presentation. Tucked under the shining stainless steel exterior of Walt Disney Concert Hall and shielded from the street by a green wall of bamboo, the Patio (seats 55) is a year-round destination for lunches or pre-concert cocktails. Plush seating, carved walnut paneling and a luminous curved ceiling provide a contemporary backdrop for events in the Main Dining Room (seats 150). Please contact for more information. 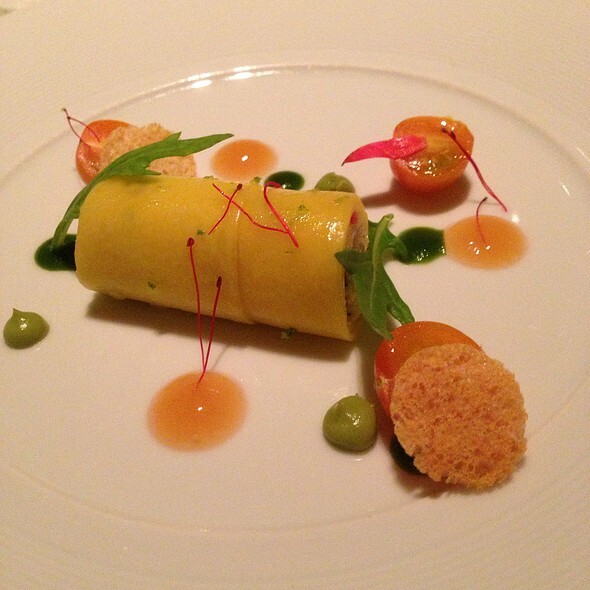 An award-winning, Michelin star-rated restaurant offering contemporary French cuisine with international influences in the heart of Downtown Los Angeles. Entering into Patina Restaurant introduces you to an evening of incomparable sophistication. Conveniently located inside The Walt Disney Concert Hall, our flagship restaurant showcases the highest culinary standards of Master Chef Joachim Splichal within an exclusive setting in Downtown Los Angeles. We offer seasonal tasting menus, artisanal cheeses, caviar service, and an award-winning wine list. With the leadership of Executive Chef Andreas Roller, our team focuses on creating a moment of culinary indulgence, from artistic plate presentation to rare wine selections. Serving as an ideal location for pre-performance dining, a special night, or to impress guests and clients, our contemporary French cuisine is truly the pinnacle of luxurious dining within Los Angeles. Prix-Fixe Menu: Three-Course Brunch $70; Children's Menu $35 | Treat Mom on her special day at Patina Restaurant. Enjoy an exclusive Brunch menu by Executive Chef Andreas Roller, featuring dishes available only on this memorable occasion. Choose from our Mother's Day beverage offerings, featuring both cocktails and non-alcoholic beverages. Children's menu available for kids 12 and under. A la carte dinner available from 4PM to close. Menu subject to change; does not include beverage. Price excludes tax and gratuity. The service was perfect. The wait staff was there when you needed something and not when you didn't. The sommelier was outstanding! Beyond incredible. One of the best fine dining experiences in the country and I’m just sorry that we had theatre tickets which forced us to leave too soon. Each course was impeccably prepared and presented and the service was attentive, gracious and perfect. It was one of the most delectable priceless experiences we’ve ever had. Every detail was remarkable and the service was extraordinary. Our anniversary was in great hands! One of the most fantastic meals ever! From the stellar and well paced service to incredible food and wine pairings, this was a uniquely wonderful and memorable experience! It was the most I’ve ever paid for a meal for two (over $400 including tip) and worth nearly every penny! The ultimate special occasion destination restaurant - in the Walt Disney Concert Hall building so most convenient for the concert we attended immediately afterwards. Amazing service, delicious food, and fantastic wine and cocktails!!! Had a wonderful time. Tamara was our server, everyone covered everyone. She did an absolute fantastic job. Kevin, General Manager greated us. He is so sweet and kind. We were celebrating our birthdays and the Chef Andraes sent out a delicious array of desserts with a generous note. All was a once in a lifetime experience. Wonderful attention to detail and considerate service made a wonderful an unforgettable experience. It was a wonderful experience! The service was lovely and the food superb! My wife and I came here to celebrate our anniversary on a Saturday evening. We both very much enjoyed the meal. I originally had a reservation for 2 and I added one guest the restaurant quickly and gracefully accommodated us even when it looked pretty full I am guessing for dining before the show. The food was outstanding and the service even better. The server was attentive but not intrusive making sure we knew what we receiving when you get the extra goodies from the chef. I truly enjoyed all the staff being very friendly and quick to answer my questions and my I say they are quite knowledgeable. I spoke my language and they kindly responded to me. The food was a wonderful experience I truly enjoyed all the flavors from the appetizer scallop crudo, wagyu beef and the delicious creme brulee truly outstanding. Food was good, presentation gorgeous, but there was no extraordinary flavors. What we loved the most was the amuse bouche, the bread basket and the tea at the end. We ordered the chef menu of 6 dishes. Food was obviously of great quality but is not revolutionary. I really liked the water menu. The service was outstanding, the ambiance was great too. For 2 people, without alcoholic beverages we paid over 500. So kinda pricey. Overall, it is an experience that you should have at least once. So I would recommend it, but probably we won't come back. All the food here is delicate, delicious and well presented. We also love the complimentary appetizer and the sweets they are very impressive. 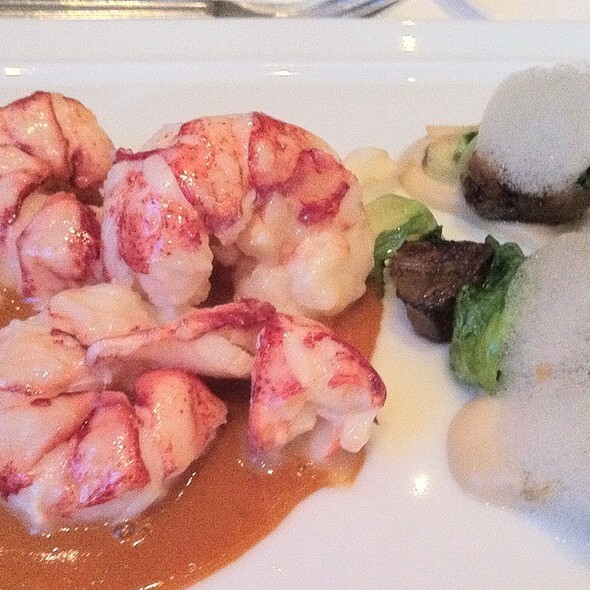 The favor of each dish is just right everything is impeccable. My son loves the hand written note from chef for his birthday. He wants to frame it and hang in his room. We will broadcast this restaurant to all our friends. Always a delicious, creative and wonderful meal. Outstanding service. Friday evening the restaurant was quite crowded. The busiest we’ve seen it in years. The service was still excellent, but the kitchen was slower than usual. They did bring us and many other guests an extra course at no charge. In view of the crowd, a few of the tables were re-configured and we had a small table for two. I was in LA for work and decided to go to the symphony and was looking for a dinner that would match the quality of the music. Patina is superb. The food is beautifully presented, the flavors fresh and original and much thought was given to the wine pairings for the prix-fixe menu. As a career woman who travels for work, one of my pet peeves is to be seated in a sup-par area when dining alone (in NY, I received vastly different treatment at an otherwise lovely restaurant when alone one week and a week later when dining with my husband). As such, it was a pleasure to be treated so well when eating solo at Patina. Bravo Patina- please continue to create culinary magic prior to the delights of the LA Phil! The food and wine pairings were amazing. The staff is extremely attentive and each course was paced perfectly so we were out right on time to go see our show at the Walt Disney Concert Hall. The valet is really convenient at the entrance/exit of the hall. Great place. Great food and great service. Also very understanding to the fact that we had to be done before a show. The food was lovely, the staff unobtrusive and helpful, the overall experience was wonderful. Very nice and service was superb. Very interesting and creative dishes. Great service from the moment my fiance and I arrived to the restaurant, the food and wine pairing was great. Compliments to the Chef, the Manager on duty and the rest of the staff. Thank you for a lovely evening! It’s was very good. I had a reservation but we had to wait about 25 minutes for our table and then when we went into the dinning room noticed there were a few empty booths, and a lot of empty tables so don’t understand why we waited. Food was great, however last course was the steak and I’ve definitely had better . It was Kobe beef, but very tough, which was disappointing. Other than that, we loved it. Patina was very accommodating to my wife’s dietary restrictions and even went as far as to write and sign a personalized card for our 5 year anniversary. We were very disappointed. Took a friend out who was visiting from DC area. For the very pricy place that it is the ambiance was zero, the fact that the only choice was a set 3 or 6 course meal was disappointing since not all the 3 course choices were appealing . The food was too contrived and not that tasty. Desserts very mundane. It cost us almoat $500 fot the 3 of us and tho we can easily afford it , none of us felt like we had a great meal. but really not for what one receives. Highly recommend. Wonderfully ornate, delicious food - in miniscule portions, but that’s to be expected from a super upscale place like this. Nice elegant atmosphere. They scored points by giving us a number of amuse bouches, a generous touch that we truly appreciated. However, the service was actually rather poor. Why? For one thing, there was simply too much of it. Our conversation was interrupted many, many times by our server and/or the sweet bus guy, checking in to make sure we were enjoying everything. I can see doing that once or twice but seriously, they interrupted us six or seven times during our 2.5 hour meal. And we were clearly having an intimate personal conversation. Aren’t they trained to sense the vibe of the table? Also, main server had an accent and spoke too quickly and quietly, making her hard for my 90 year old mom to understand. Not her fault she has an accent but Patina should work with accented staff to get them to speak slower and all the more clearly because of it. Three people had dinner for $465 including tip. For that I would expect a truly exceptional experience. Despite the great amuse bouches, this was an “OK” experience overall. Worth more like $250. I loved our kind waitress Olivia, The food was outstanding with such amazing flavor and mixtures.Also such kind people to take your request with care. I loved the ribeye steak and BBQ sauce it had a nice flavor, also the wine and desserts were a treat! The whole staff are so pleasant and all had a smile to offer. The dining experience had been elevated because of the excellent service. Fantastic food and impeccable service. Certainly not the place to go for "value", but highly recommended as a fine dining option. Notable highlights were the black bass and wagyu main course. For Special Occassions only. Very expensive. Male waiter a little impatient, if you don’t order bottle water. We went to celebrate Valentines Day a day late. Food was outstanding! Our servers treated us like VIP’s. Wonderful evening!! the food is very delicious, the service is very satisfied. Food was delicious, creatively prepared and presented. Truly a lovely and memorable experience.